Suvidya Foundation provides the Textbook-on-tablet technology to other NGOs free of cost along with the required training to increase their own impact in the field. If you are an NGO working with rural government schools and would like to avail this technology, please contact us at contact@suvidyafoundation.org. 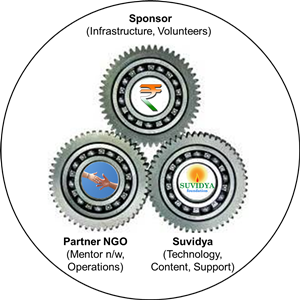 Suvidya Foundation is also continually looking for partnerships to develop vernacular, curricular content for schools in different states in India. If you are an NGO with content development expertise and would like to get involved, please contact us. The picture shows the model that Suvidya has adopted for deploying the Textbook-on-tablet solution in Government schools. Currently enriched curricular content is available for Karnataka state board Kannada medium syllabus for 5th, 6th and 7th standards. Similar content for other standards is being developed. All partner NGOs can use this content and the Textbook-on-tablet technology free of cost. We invite more and more NGOs to participate in this program and take advantage of the technology to make a greater impact. Partner NGO raises sponsorship for infrastructure including tablets and solar chargers.